Discussion in 'General Shaving Talk' started by Ron R, Jul 21, 2018. I was buying some Vintage Gillette razors at a Antique store and the fellow who owned the store was showing me some scuttles when I came across this relic. The sharpener hone was patented in the 1930's(dirty thirties) so that could tell us that blades were expensive and scarce for folks who had very little and had to watch every penny. but this glass is very dark and black. The thirties brought out a lot of innovations to try and survive and it made north Americans more frugal in there effort to survive a financial disaster. 178-bplatoon, brit, PLANofMAN and 8 others like this. I've never seen one in real life, but I understand some would use the inside of a glass to hone their old blades. brit, Edison Carter and richgem like this. I'm big on using carbon blades but have never bought into the idea of these glass hones; the angle you end up rubbing the blade at only rubs the flat face of the blade while the cutting edge is barely touched, if at all. But I do have an Aloxite hone. If the blade is held just right...very very lightly rubbed on the surface, where the cutting edge itself contacts the stone...it can re-edge a carbon blade. Stainless, I don't know. Maybe it'll do a little edge straightening but really not worth the effort with blades being so cheap. Edison Carter and Keithmax like this. I would think a drinking glass would work also, the glass on this hone is very smooth with a few chips on the underneath belly side that would not affect the honing performance. We had to dicker on this one and I bought it for $9 as a conversation piece and may even try it some day. Screwtape, brit, Edison Carter and 2 others like this. I would think it was for the older thicker blades. PLANofMAN and Edison Carter like this. I was thinking along the same thought process about the edges barley touching , I would put a thin plastic skid underneath (1/16 thick X 3/16 wide?) in the center of the blade so when honing the the edges are in contact instead of the whole blade. How effective I'm not sure, but I will test it in the next few weeks for curiosity sake. Tried a nylon skid and that was not that good because it wants to float and with some modifications it still was not good, just use feel is the best and safest IMO if attempting. brit, AGHisBBS, Edison Carter and 3 others like this. That should work fine -- a strip of hard nylon or something slick -- anything to (not sure how to put this) increase the downward bend of the blade's edges so that they, and not the face of the blade, come in contact with the hone. Me, I just use extremely light pressure; not pushing the blade flat against the hone, which defeats the purpose. Now that I think of it, I believe the Aloxite's instructions indicate this. You ever see those old marble hones, where two marbles touch each other in a simple steel frame and the blade is slid between them? I'd imagine that would work IF the blade isn't pushed too far in and only the barest edges is straightened between the marbles. The Shake Sharp razor also does a decent job of maintaining an edge, but only on carbon blades. The consensus of those who tried it some years ago was that it does little to nothing for modern stainless blades. They're too hard and too beveled to take messing with, and I suspect glass hones would be useless on them. But it's worth a shot! Screwtape, Edison Carter and Keithmax like this. $9.00 is a good price, I have seen them go for a lot more. I have some diamond paste that I used on my hunting knifes for polishing and maybe I can diamond charge the glass to see if it works, I was into sharpening knifes and that is how I stumbled into DE shaving by accidentally looking up on Youtube articles on razor sharp edges that brought back memories of my father shaving with the Gillette razors. I have lots of time to experiment, a new little project to tinker with down the road. I find that the second shave on a sharp blade hits the sweet spot for any razor blades for me. The first use on a sharp blade always seems harsher and for me causes more weepers and possible nicks. I use the glass blade hone to knock back that roughness. A few gently rubs on both sides of the blade makes blades shave on first use like they were actually a second use/sweet spot shave on just about any razor blade. I guess the hone takes the roughness off of the blade and smooths everything up nicely?? Works for me! Try it out yourself with your new glass hone. I will give it a try in the near future, another method of taking the roughness off the first pass on a new blade is to cork it. I have the Polsilver SI that is a great blade and has a long life in it but I do one swipe through the cork for about 1/8 inch depth and it seems to smooth the blade to my likening on the first pass(its the only blade I do- must be the excess coating Iridium when applied to the blade?). Keithmax and gorgo2 like this. July 31st 2018, Well had my first shave with this makeshift glass hone from a straight sided drinking glass and the shave was excellent (BBS), this is the first time that I have had positive results from many attempts from denim to leather to .25 micron diamond paste and hand stropping. The secret to this early experiment procedure testing IMO is fill the glass with hot tap water and dump some out and tilt the glass 30 degrees approx keeping some hot water in the glass pointed slightly down sideways and press blade so it does not bottom out in the center and swish left to right for maybe 6 to 10 complete cycles and flip and do the other side and do the same cycles. The results to me were a sharp blade but a little different feel it seemed. From other research articles this will not sharpen a blunted or very dull blade because it does have the grit coarseness to recoup a bad edge, this method is keeping a blade sharp as the blade is becoming slowly worse as it degrades a little. It is more a stropping method possibly and with some edge rejuvenation. The hot water softens the steel a little so the honing is more effective and any edge curling can be brought back more easily. People think that stainless steel is hard but carbon steel from my machining experience is usually harder if heat treated properly. It's a little early to get far fetched with this simple honing method so will do some more testing & see if will keep the edge up for how many shaves? Blade being used is a ASTRA SP with 7 shaves and # 7 being the start of the glass honing experiment. Edison Carter, AGHisBBS, Keithmax and 1 other person like this. Aug 5 2018- Shave #12>Astra SP > Still tinkering with the makeshift glass strop hone, I have a jewelers loupe 30 X 60 magnification that help these eyes of mine, the blade does not show any chips out of the blade yet. The razor I used was a Razorock Mission Mid aggressiveness 5-5.5/10 IMO and it performed reasonable for a DFS considering the coating of the blade has mostly disappeared. No nicks or weepers yet on this shave, I have been mostly concentrating on 3 razors Gillette new long comb, Razorock Mission and Gillette SS British and American. I do shave every day so change is noticeable of coarse on this blade and its reasonably sharp for my beard type & did the job. To reach higher # of shaves and to simulate what the old timers were doing I might stay with the Gillette New long comb 1930's & Gillette SS speeds milder razors to stay with the dirty thirties theme and WW2 scarcity of metals for the war effort. The Gillette New long comb to me is a 4.5-5.2/10 aggressive razor where the Gillette SS are 4-4.5/10 on aggressiveness. I was watching some You tube videos on razors under a microscope because the human eye is limited to seeing great detail. This chap had a very elaborate microscope for checking straight edge razors he sharpens for customers. He takes permanent markers and applies the ink to the edge to highlight what is happening when he is sharpening. I decided to do the same with my little glass strop hone to see how the sweet spot is getting stropped and honed. This a feather blade that has not been used for a while and the picture shows the area being honed and is shinny and highlighted with the ink gone after 20 cycles of stropping left to right and backwards and forwards. The blade had 4 shaves and still cuts free standing hair on my arm and so it will be used for some shaves in the future! Something to do on a boring Sunday evening. AGHisBBS, brit and Keithmax like this. 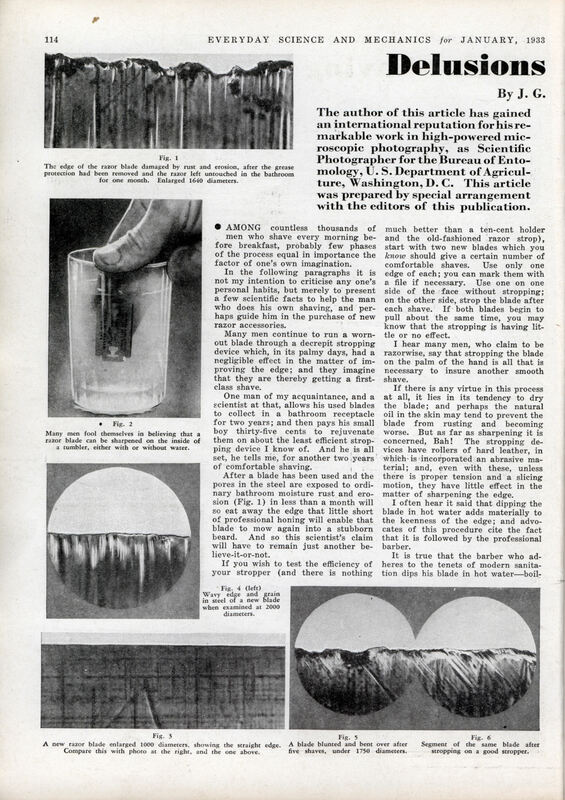 The author of this article has gained an international reputation for his remarkable work in high-powered microscopic photography, as Scientific Photographer for the Bureau of Entomology, U. S. Department of Agriculture, Washington, D. C. This article was prepared by special arrangement with the editors of this publication. AMONG countless thousands of men who shave every morning before breakfast, probably few phases of the process equal in importance the factor of one’s own imagination. In the following paragraphs it is not my intention to criticise any one’s personal habits, but merely to present a few scientific facts to help the man who does his own shaving, and perhaps guide him in the purchase of new razor accessories. Many men continue to run a worn-out blade through a decrepit stropping device which, in its palmy days, had a negligible effect in the matter of improving the edge; and they imagine that they are thereby getting a first-class shave. One man of my acquaintance, and a scientist at that, allows his used blades to collect in a bathroom receptacle for two years; and then pays his small boy thirty-five cents to rejuvenate them on about the least efficient stropping device I know of. And he is all set, he tells me, for another two years of comfortable shaving. After a blade has been used and the pores in the steel are exposed to ordinary bathroom moisture rust and erosion (Fig. 1) in less than a month will so eat away the edge that little short of professional honing will enable that blade to mow again into a stubborn beard. And so this scientist’s claim will have to remain just another be-lieve-it-or-not. If you wish to test the efficiency of your stropper (and there is nothing much better than a ten-cent holder and the old-fashioned razor strop), start with two new blades which you know should give a certain number of comfortable shaves. Use only one edge of each; you can mark them with a file if necessary. Use one on one side of the face without stropping; on the other side, strop the blade after each shave. If both blades begin to pull about the same time, you may know that the stropping is having little or no effect. I hear many men, who claim to be razorwise, say that stropping the blade on the palm of the hand is all that is necessary to insure another smooth shave. If there is any virtue in this process at all, it lies in its tendency to dry the blade; and perhaps the natural oil in the skin may tend to prevent the blade from rusting and becoming worse. But as far as sharpening it is concerned, Bah! The stropping devices have rollers of hard leather, in which-is incorporated an abrasive material; and, even with these, unless there is proper tension and a slicing motion, they have little effect in the matter of sharpening the edge. I often hear it said that dipping the blade in hot water adds materially to the keenness of the edge; and advocates of this procedure cite the fact that it is followed by the professional barber. It is true that the barber who adheres to the tenets of modern sanitation dips his blade in hot water â€”boiling water in factâ€”not to sharpen it however, but to sterilize it against possible germs. If there were any appreciable effect from the hot water, it would be in an adverse direction; for heat expands, and the edge of a blade enlarged a billion diameters would approximate in sharpness the blunt prow of a battleship. Hot water on the face instead of the razor, however, tends to soften the beard and permits the razor to cut with greater ease. From the dawn of the razor industry it has been believed that the edge of the blade was endowed with microscopic teeth; that these became bent over; and that stropping brought them back into alignment, permitting further comfortable shaving â€”and drubbing on the concave surface of the tumbler would seem to accomplish the same result. I have shown in a preceding article (January, 1932, issue) that the teeth on a razor blade are in the same category with the “hoopsnake” and the bunnies which lay our Easter eggs. Under a microscope magnifying 1,000 diameters (Fig. 3), the edge appears perfectly straight; at 2,000 diameters and beyond, the edge appears wavy or scalloped (Fig. 4) according to the nature of the steel and the processes employed in its manufacture. There are no teeth to straighten up, although the edge is bent over and blunted by shaving, as seen in Fig. 5; and there are two ways in which this can be corrected. back into place toward the edge, as seen in Fig. 6. It is these bent-over and blunted fibers which cause the blade to pull, and to merely compress them, by rubbing on a SMOOTH surface, would tend to leave a ridge where there should be a clean sharp edge. The process could not be expected to have a very beneficial effect. In some cases, however, the tumbler actually does tend to sharpen the blade, but to a very mild degree; and I would venture a guess that the vast majority who are resorting to this practice are receiving no benefit from it at all. With heavy blades, sufficient pressure can be exerted upon the edge to compress the bulged fibers a little and with such blades (the Gem, Metro, etc.) I have noted sufficient improvement to give me an extra shave; although further use of the tumbler proved futile. With thin blades (such as Gillette, Probak, etc.) if there has been any improvement in the edge from the tumbler trick it has been too slight for me to be sure of it; and the reason is apparent from Fig. 7. The slightest pressure tends to bend the blade and throw the cutting edge out of contact with the glass; and, if it is bent to the contour of the tumbler, as seen in Fig. 8, it might just as well be rubbed on a flat surface. In spite of what I consider ample proof to the contrary, I can point you out a dozen men of merely my own acquaintance who will declare that a turn or two in the tumbler is all that is necessary to insure a great number of perfect shaves. If you want a better shave, throw away the tumbler and take a new blade; or else invest in a ten-cent holder, and strop your used blades, as you used to do the old straight razor. One reason why I have dwelt at length upon the tumbler trick is that, at the present time, there are being put on the market devices which work upon the same principle; and, if you wish to spend good money for them, it will only go to show that the famous utterance is as true today as it was in the days of Barnum. The above remarks about the tumbler, however, do not apply to certain various honing devices, which are of similar shape, and are also making their appearance in ever increasing numbers. Although with these the average person will bend the blade to the concave surface, and therefore secure no results, they really have considerable merit if used properly. With a heavy blade it is possible to perform a certain amount of grinding; but the blade should afterward be smoothed up on a regular stropper. With thin blades, even the slight pressure necessary to move the blade back and forth is generally sufficient to bend the edge out of contact, with the result that no improvement can be expected. This difficulty can be overcome, however, by placing on top of the thin blade a flat plate of proper size, so that pressure upon the hone will be exerted upon the outside edges, Fig. 9. With even greater rapidity than the tumbler trick, the notion has spread that a blade can be sharpened by drawing it between two steel balls. A blade pressed up snug between the balls and looked at through a binocular microscope shows clearly, as seen in Fig. 10, that the cutting edge does not touch anything; whether the supposed sharpening is performed by magic or otherwise, I have not been able to learn. I have tried all the abracadabras in my limited collection, and have yet to find one that will cause this contraption to give me an extra shave. Point “C” jams into the contours of the balls before edge “B” gets down into crotch “A.” Pressed with sufficient force, as seen in Fig. 11, contact at “C” separates the balls ; opening up a channel through which the edge “B” travels without hindrance. If these balls were made about the size of BB-shot, the device might have a chance to do something ; but whether or not it would improve the blade to any great extent, is highly problematical. Devices similar to the above are being sold by the million, the vendors cluttering vacant-store entrances wherever you go; and, whether the marvelous wood and hair cutting feats performed on a single blade before the gullible public are on the up-and-up, I will have to refer you again to Ripley. Regarding these demonstrations which we have all watched with interestâ€”to slice into a piece of paper with a new blade would ruin it for shaving purposes; to cut a match stem would so mutilate the edge that nothing short of honing would rectify it; and to hack into a stick of wood, or cut shavings from a piece of lead, and even hope that any treatment whatsoever could ever repair the damage, would be the height of folly. Yet this is the demonstration used to sell certain abrasive dope for the razor strop ; and the legerdemain, which permits the agent to slice off a single hair after the blade has been thus abused, I have never been able to solve. If some reader will enlighten me, I will be greatly obliged. I will say this for their product, however, that to an intelligent public such high-power salesmanship should not be necessary; for the blade holder and the little strop which accompany the stick of dope are well worth a quarter, and are all that is necessary to insure perfect reconditioning of used blades. One fact that I should like to bring out, in closing, is that there are probably few things in life as variable as men’s whiskers ; and, although they all seem to fall before the straight blade of the barber, such is not the case with the modern safety razor. A razor that will give smooth and comfortable shaving to one person may be entirely inadequate on a beard and skin of different texture. Doubtless seeking a way out of the depression, new firms are springing up almost over night and are flooding the market with blades whose names are legion. But I am glad to say that their products are getting better all the time; and, instead of two or three shaves as heretofore, the tendency is to produce blades that will give many times that number; but you must find the one which suits your individual needs. The man whom I employ to conduct most of my shaving experimentsâ€”on account of his tender skin and bristles which would do justice to a modern Mosesâ€”came to me recently highly elated with the fact that he had just gotten fifteen perfect shaves, without stropping from the Whoosis Razor, which had just come out. Of course I secured one, to add to my collection if nothing more, but one shave showed that it was not for me. I drew blood in three places, besides nipping off a slice of my lip. Although I have a cabinet full of razors, all the modern ones, and ancient ones dating back to the Roman days, I must confess that, when shaving for comfort and not for some scientific test, I use probably the cheapest blade on the market (as it retails four for a dime at the ten-cent stores). With this blade shaving is such a quick and pleasant procedure that I have tried to interest some of my friends ; but, more often than not, after a single trial, they return it with an adverse report. I have a collection on about a dozen sharpeners of different design. It is interesting to me (having grown up in an era of disposable everything) that people were at one time reluctant to dispose of something that was DESIGNED to be thrown out. This 1944 film I came across shows maybe how hard it was to purchase necessities during the WW2 and so people improvised (glass hone)to get by as far as they could because of shortages in the War effort of that time era. The first minute or two is about a guy who buys one blade from a chemist >British term for drugstore and the film is dedicated on how to improve your razor blade care for a long time because of shortages. ( maybe they were only allowed to buy one because of War rationing?) Its a good film to watch and not so much a throw away society & they had to strop their razor blades. Hairy Alaskan and Frijolero like this. Aug 7/2018 Shave #14 it looks like my blade is tugging a little to hard for my comfort zone & 1 weeper in the chin area but it still took off the whiskers and delivered DFS<SAS with a 1930's Gillette long comb. It was a interesting experiment and yes I did use the Antique Velvet glass hone (the glass texture is smoother with the antique hone? )but it was not a whole lot different than the glass drinking tumbler for results. For what it's worth, I enjoyed it and improvising equipment and there are still unknowns like always but like I mentioned earlier I have a 8 yr supply of blades to go through. 3: Under tough times & scarcity or in a hotel and forgot your blades and only blade in the razor is dull a drinking glass will more than likely get you out of that pinch until you can get new ones. 5: You would look more presentable for potential job or just personal appearance sake for that time period! 1: There is a additional step involved in your routine. 3: your lose the coatings through use and they do help for comfort of a shave. 5: It will add time if that is a concern for the procedure. 6: You will get more tugging of beard and thus possible irritation of skin. Oh well there's my $.02 worth of thought from a shaving enthusiast on the glass hone strop in our times!